Made a comparison GIF that shows Asuka, Shinji and Rei's models as presented in the 3.0 artbook (and in that silhouetted teaser ad for 3.0), overlayed on their respective shapes in the leaked/deleted photo. The legs and overall body placement are easily matched, followed by the facial features and other plugsuit details... Which basically shows the models used are the same? With the only difference being Rei's plugsuit, most noticeably the color, which looks lighter in the photo (perhaps a hint to a white plugsuit variant). The only way to really tell if it was a mistake is to repost the leaked photo and see if Toho files a DMCA over it. If they do (like they did for a leaked trailer) then it was an honest mistake. If they don’t, then it probably wasn’t. Zeruss wrote: Here's a fun... thing? Nicely done Zeruss! Do you have an unedited version of the original image? OOOOOOOOOO So exciting!!!! I was pretty sure those guys were still alive. The way they were referenced in 3.0 was so vague and noncommittal to either outcome, I figured it was just framed so that Shinji and the audience would assume that were dead and they would be revealed in 3.0+1.0. Thank you, Zeruss and Reichu, for annotating/editing this. This character chart is really bizarre. 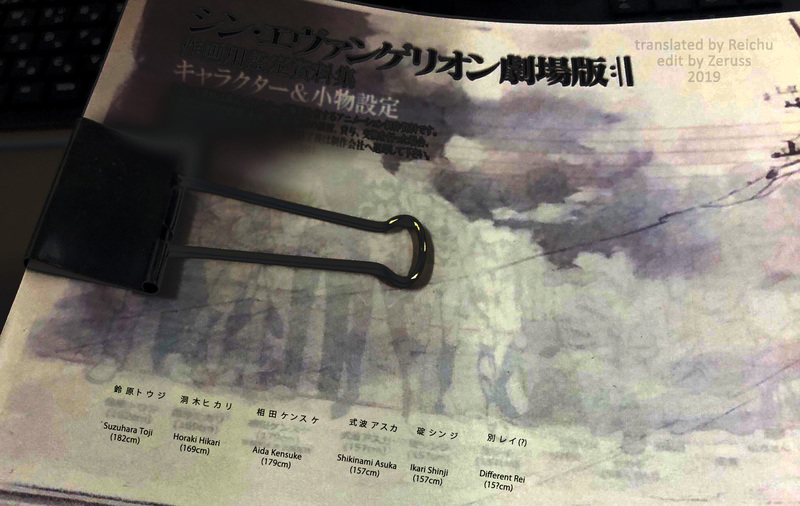 Toji, Hikari, Kensuke, Asuka, Shinji, and Rei's annotations are formatted in a uniform, in-line shape, but the characters that follow Rei to the right have their names/heights positioned haphazardly. Some characters look as though they aren't provided corresponding heights. Makes me think the characters that follow Rei are nameless grunts, but then, why would they take up space with Shinji et al? It feels too early to make random character guesses of who's who, although I'm sure we'll get Kaworu in some form. Pen Pen and Kaji would be a dream come true I guess somewhere down the line (e.g. once Shin Eva's out), we'll get a character chart/reveal like we did for 3.0 before and after? FreakyFilmFan4ever wrote: The only way to really tell if it was a mistake is to repost the leaked photo and see if Toho files a DMCA over it. @Qmisato: Welcome to the board! You're looking for this thread, I think -- it replaces the last locked introductions thread. The right-most person in the chart has four characters in their name, and the second one looks like a 力 or カ. Second-to-right person only has two kanji for their name. -Are Toji and Hikari married? Do they have a kid? -Is Kensuke a badass special forces agent or tech guru? -What are their relationships like with Asuka, Mari, and Misato? Gendo'sPapa wrote: I think we'll hear a lot of Gunbuster soundtrack cues in the Final score. Anno has been smartly re-contextualizing musical bits from his previous anime series in Rebuild. Gunbuster is the major one left I don't recall (though I could be wrong) getting a callback/re-contextualized in the series so far. I remember speculating on this being a possibility years ago, but I ultimately think Gunbuster OST references are less likely because, unlike Kare Kano and Nadia, Sagisu didn't do the music for it in the first place. Last edited by Guy Nacks on Sat Feb 23, 2019 9:05 am, edited 1 time in total. I'm #TeamIntentional. They blur everything all the time and somehow a super evident leak like this happens? I don't buy it. Native Japanese people were able to read the text without even editing the image, for sure they knew the names were readable. I don't know why they would do something like this however. I don’t know if the leak really was intentional or not, but here are a few things to consider before bandwagoning. 2) Toho is VERY experienced in traditional marketing, and actively tries to prevent non-traditional forms of advertisement. The online leak of the teaser was enough to incline them to take action against illegal uploads of their leaked trailer. Their silence on this is an interesting factor, to say the least. 3) You can only take so many pictures of pencil boxes and blurred pages before someone feels the need to spice it up a bit. Crap, these points just confuse matters even more! Never mind. I feel the need to remind people we got confirmation Hikari's actress has a role in the film. So this whole thing isn't that crazy/unexpected. A 0$ budget way of attracting attention before trailers and stuff. They are probably saving actual pics of characters for later. This is a nice tease. I just think it's a situation where a bit more tact is good, you know? I 100% agree with Freaky that because Khara isn't well-versed in social media (and they have, what, at least 3 Twitter accounts they're running?) that this was a mistake on their part. Their various script thickness/studio look-around picture uploads in the past always made a point to blur this and that. Mistakes naturally happen. That aside, it's pretty cool to just see how much volumes of work EvaFan reported about the character/art sheets that Khara's been referencing. I mean, 6 volumes of materials with it increasing? kuribo-04 wrote: I feel the need to remind people we got confirmation Hikari's actress has a role in the film. Which by itself doesn't mean anything, seeing how she also voiced Hikari's sisters in Shinkalion. Hm, I see where you're coming from. But I think it was still pretty clearly a hint. It was specifically a Shin Eva event. And Hikari's sisters have never been part of NGE or Rebuild. It somewhat looks like Asuka has white hair (or at least very much lighter than her usual color). Also, based on the patterns on Hikari's legs, plugsuit? I think the tweet was intentional, but Khara'll be damned if people have that impression. They've been really good at avoiding this kind of thing for two years. The spoilers were right smack dab on the front page. They posted multiple versions of the front page. They painstakingly made efforts to blur out small words right over Toji's head. If it was absolutely a flub, it's a mortifying, embarrassing one, and someone's getting fired. The character two spaces to the right of Rei is legit, I think, because they come with a name and a height, and their name/height is properly formatted in-line with the rest of the cast. amitakartok wrote: Which by itself doesn't mean anything, seeing how she also voiced Hikari's sisters in Shinkalion. I don't think it's meaningless. The NYE party was expressly to celebrate voice work on Shin Eva, whether the actual work had started or not. If Koichi Yamadera had been photographed there, people would definitely make a fuss about it. It's just that Hikari's voice actor is less known, at least among Western fans, so we weren't primed to think anything of her being there. Until now. I dunno, man. The cat’s been out of the bag for a while now, what with the VAs for these characters already having been confirmed. Like, none of that size chart is tantalizing after that. I see no reason to stage a leak for publicity’s sake. I also see no reason for them to have deleted it either. But, then again, maybe the strongest argument to this being staged is the fact that none of the information leaked was new or revealing anyway? If the leak simply repeats what’s already been confirmed, then why not use this harmless illustration to stage a leak? I guess my ultimate point is that it’s no big deal either way. Like, sure, at first it seemed earth-shattering to me, but then I remembered that nothing new was revealed, so what does it matter? I’m just glad they haven’t accidentally revealed the fact that Mari has actually been an Evangelion Unit this whole time. That would have been devastating.